Let CellSite Solutions provide outdoor telecom cabinets for your next project. Browse our current inventory or contact us for more information! Telecom cabinets are the ideal way of storing and protecting equipment at remote sites. 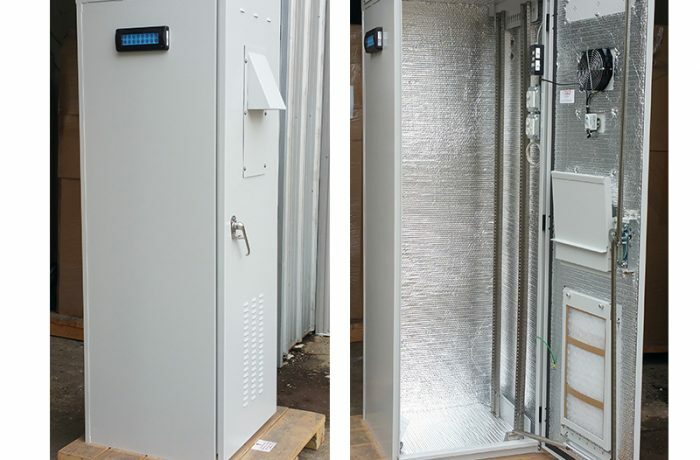 These outdoor telecom equipment cabinets come in different styles and sizes, but all have the same general purpose: to protect valuable equipment from natural elements and vandalism. Why Purchase a Telecom Cabinet? When you are in the telecommunications equipment business, you know all about equipment expenses. Even a little piece can be costly to replace or repair. Having the proper storage and protection in place can help you minimize, or even avoid, these costs. In many cases, the right telecom cabinet could pay for itself in just a short time because of lowered repair expenses. In addition to protecting equipment, it is important to realize that your equipment could be dangerous to curious children or animals. Placing this gear in properly latched cabinets will help avoid dangers and could protect you from liability, should anything happen. At CellSite Solutions, we offer two distinct styles of used or surplus cabinets to best meet the needs of our customers. Once these different types are understood, you will be able to determine exactly what is needed for your equipment. Battery Storage Cabinets — Battery storage cabinets offer a convenient way to store spare batteries - even massive gel cell - on a remote site, allowing for simple access to backup power. Our battery storage cabinets include temperature control features to assure that your equipment is well-maintained throughout the year. Transmission Cabinets — Transmission cabinets are equipped with numerous transmission racks. The purpose of transmission cabinets is to protect radio equipment on site, assuring you can provide excellent service at all times. Once you have decided an outdoor telecom cabinet is the right choice for your mobile equipment, why shop at CellSite Solutions? First, we are experts dealing with anything related to new and used telecommunication equipment. We are willing to work with you, make suggestions and help you choose the perfect cabinet for your particular needs. Our goal is your satisfaction — not just making the sale. Secondly, we offer products that are second to none. We sell both surplus and used telecom outdoor cabinets, so you can find the exact product to meet your needs, without breaking your budget. Finally, CellSite Solutions believes in excellent customer service, so we are always here for you — before and after the sale. Finding the perfect way to protect your outdoor telecom equipment does not have to be a challenge, and you do not have to deal with the process alone. Allow CellSite Solutions to help! Call or contact us online today to talk to one of our experts about what products we currently have available and to choose the right solution for your business. We look forward to helping you with your telecommunications business — every step of the way.